Mucoceles arising from the sphenoid sinus or a posterior ethmoidal cell are uncommon and may result in compression of the optic nerve and adjacent structures, leading to orbital apex syndrome. The Onodi cell is a posterior ethmoidal cell that is pneumatized laterally or superiorly to the sphenoid sinus with close proximity to the optic nerve. Mucocele formation in such a cell may lead to compressive optic neuropathy. In this paper, we report a patient with subacute visual loss secondary to an Onodi cell mucocele, who fully recovered visual function following endoscopic removal. Onodi cell mucocele should be included in the differential diagnosis of a young patient with compressive optic neuropathy. Minimally invasive surgery should be considered for urgent optic nerve decompression. Mucoceles are non-neoplastic cystic lesions consisting of a collection of mucus lined by a pseudostratified respiratory epithelium with a chronic inflammatory infiltrate [1, 2]. Mucoceles occur most frequently in the frontal sinus, as well as the ethmoid, maxillary, and sphenoid sinuses. Mucocele of the anterior clinoid process remains a rare cause of optic neuropathy with only 19 cases reported in the literature [1-4]. We report a successfully treated case of subacute visual loss caused by mucocele of Onodi cell. Figure 1. Axial computed tomography (CT) scan: expansile soft-tissue mass in the left anterior clinoid process with erosion of the medial wall and compression of the optic canal. A 42 year-old man presented with rapidly progressing diminution of vision in his left eye over the past week. There was no orbital pain, headache or fever. On examination, vision in the left eye was limited to perception of light; in the right eye it was 10 /10. There was an afferent pupillary defect on the left. Extraocular movements were full with no nystagmus or ophthalmoplegia. There were no other cranial neuropathies. Fundoscopic exam demonstrated oedema grade 2 in left optic nerve. CT scan of the brain revealed an expansile soft-tissue mass in the left anterior clinoid process with erosion of the medial wall and compression of the optic canal. (Fig. 1). 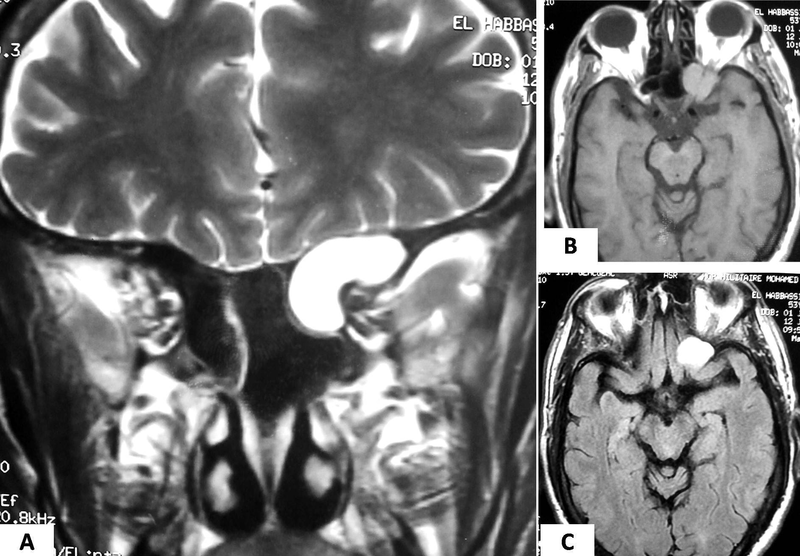 An MRI with gadolinium-enhanced sequences showed a well-defined expansile lesion in the pneumatized left anterior clinoid process. The lesion appeared hypo-intense on T1- weighted MRI, hyperintense on T2-weighted MRIs and FLAIR. The lesion completely encircled the orbital apex and intra-canalicular portion of the left optic nerve (Fig. 2). Based on the imaging characteristics, a presumptive diagnosis of anterior clinoid mucocele was made. Figure 2. A: Coronal T2-weighted MRIs and FLAIR with gadolinium-enhanced sequences showing a expansile lesion in the pneumatized left anterior clinoid process. B-C: Axial T1-weighted MRI: lesion completely encircled the orbital apex and intra-canalicular portion of the left optic nerve. The patient underwent an endoscopic transnasal approach. A wide bilateral sphenoidotomy and left posterior ethmoidectomy were completed to access the anterior clinoid lesion. Adequate decompression of the optic nerve was achieved. The overlying mucosa was stripped off and the capsule of the mucocele was cut allowing drainage of the thick yellowish mucoid contents. Postoperative course was uncomplicated. Histopathological examination of the surgical specimen was consistent with a mucocele. The patient noticed an improvement of vision in the left eye following surgery. At 6 months follow-up, the patient preserved complete vision in the left eye without any deficit of visual fields or color vision. The term Onodi cell refers specifically to a variant of a posterior ethmoid air cell which enters the sphenoid bone [1, 3, 5]. The clinical significance of an Onodi cell is that it is closely associated with the optic nerve, and the optic nerve often runs close to the small cavity of the Onodi cell [2, 5, 7]. However, they are anatomically distinct with an incidence of 8%–14% [4, 5]. Therefore, a mucocele in an Onodi cell is extremely rare with only 19 cases reported in the literature [1-14]. Irrespective of the pathophysiological origin of mucoceles, the expansion and chronic inflammation lead to gradual resorption and remodeling of the surrounding bone. Further enlargement can induce a mechanical compression of the optic nerve, causing retrobulbar optic neuropathy [2, 4, 6, 10]. The main symptoms caused by primary mucoceles of the anterior clinoid process are orbital symptoms, such as retro-orbital pain, diplopia, and progressive visual loss [7, 8]. Optic neuropathy occurs as a result of direct compression of the optic nerve, while contiguous spread of the inflammatory reaction from the lining of the mucocele may result in optic neuritis [2, 3]. Radiologic studies, including axial and coronal MRI and coronal CT scans, are important in diagnosing this lesion. Axial and coronal MRI scans are valuable for detecting orbital apex lesions, and a coronal CT scan is useful for the differential diagnosis of an osseous origin and preoperative evaluation [7, 9, 10]. MR imaging complements the CT findings and defines the relationship of the mucocele with surrounding neurovascular structures with greater precision [2, 3, 9]. The MRI characteristics of these lesions can vary considerably depending on the water and protein contents of the cyst. These lesions also tend to be non-enhancing, although mild peripheral enhancement has been described . Mucoceles with homogeneous enhancement and isointense signals on both T1- and T2-weighted sequences may occasionally mimic a neoplasm [9-11]. The principal therapy is an immediate decompression of the optic nerve via an endoscopic transnasal approach [1, 3, 7, 12] or a transcranial approach [2, 8, 13, 14]. A large marsupialization of the mucocele is generally definitive and complete removal of the cyst wall should be performed whenever possible [1-3, 7, 8]. Medical management of these expansile lesions may include intravenous antibiotics and/or high-dose steroids [1-3]. Following surgical decompression, the recovery of visual function is variable [1-8]. While the optimal timing of surgery is not well defined, Excellent results can be obtained if the nerve is urgently decompressed. Although patients presenting late have a poorer prognosis, some patients may still improve significantly with surgical intervention [9, 13]. Special thanks to Pr. Abdelhamid Messary for help with revision and writing. Warm thanks to Asri Abbad Cherif for his involvement in this work.